Note: The Bratcam continues to evolve, and since this initial post, has had significant updates. These are described in separate threads, which can be found via links at the end of this post. As promised, I’m posting my version of a macro rig. A couple of friends dubbed it the “Bratcam” (just why is a long story), and since that’s easier to say than “my photomacography rig,” I’ve continued to call it that. The Bratcam handles all six axes of movement and is very steady. 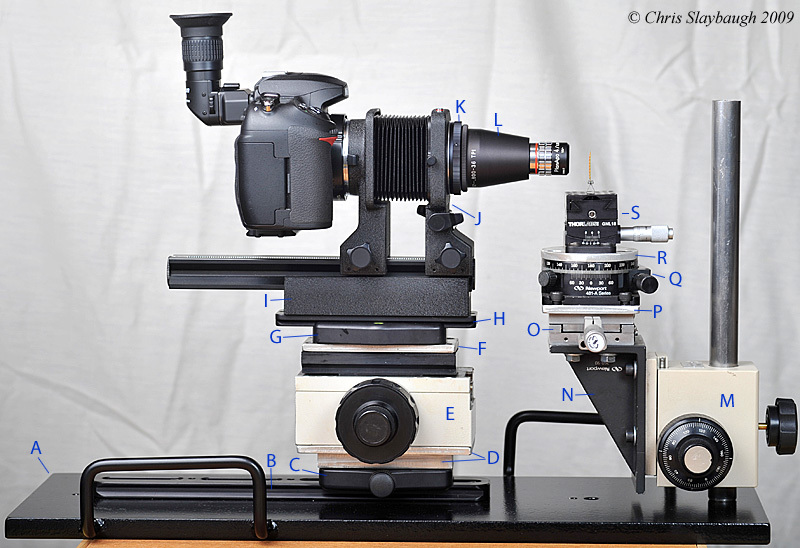 I’ve tested it with microscope objectives from 2.5x through 60x, and it handles them all pretty well. At 60x, I need to exercise a bit of care, but not too much. At 10x and 20x, I could probably tap dance while using it (that is, if I could tap dance). I see no vibration or slop during rough focus, fine focus, subject positioning, or focus stacking movement. All axes of translation and rotation are adjustable with micrometers or microscope focusing blocks. 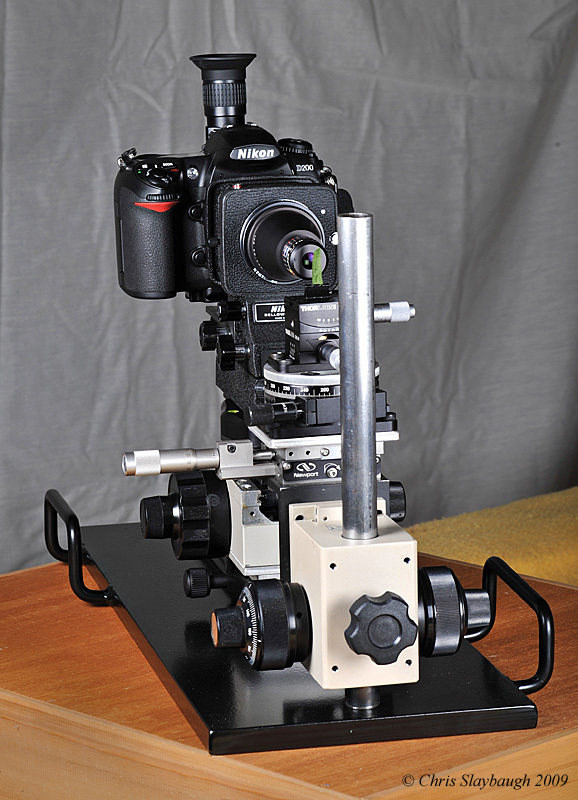 Only movement along the through-the lens axis is handled on the camera platform (in a horizontal rig like this one, this movement is of course “y-axis translation”—but those familiar with vertical rigs might prefer to think of it as the equivalent of their z-axis). The other five axes of translation and rotation are handled on the subject stage. Over the next few months, I hope to add a stepper motor and computer control to the camera movement. A—Steel base plate. Measures 8x22x5/8 inches, 38 lbs. Additional holes along center line permit changing position of dovetail plate and stage post (to accommodate a wide range of bellows extensions). Powder coated. Made for me by Don Wilson, a fabricator whose contact information I’ll give below. B—12-inch Arca-Swiss compatible dovetail plate from Chris Hejnar, who sells varied plates at economical prices as eBay seller krosno65. He also accepts custom orders. This dovetail allows fore-aft camera positioning (y-axis, but may be thought of as z-axis to those more used to vertical rigs). C—Kirk 4-inch Arca-Swiss compatible clamp, mounted upside down to clamp onto rail "B." The use of this clamp and the one labeled “G” allow the focus block to be quickly removed for use on a tripod for more standard macro work. E—Focus block cut out of Nikon microscope. Coarse and fine movements are coaxial, and the fine movement works for the entire length of travel. Travel is a bit over 2.5 inches. I think, but am not sure, that the focus block came from an Optiphot (it was already cut off when I bought it). 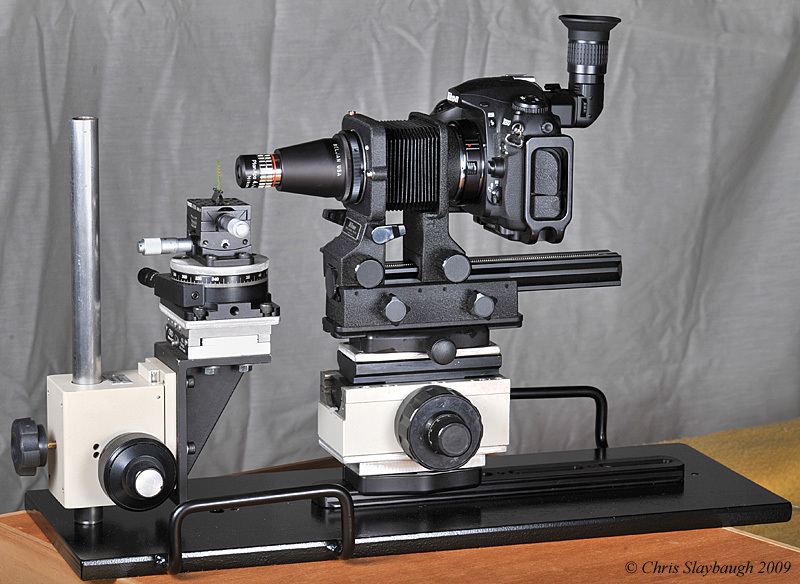 This allows focus and focus stacking movement along the y-axis (again, “z-axis” for those used to vertical orientations). I—Dovetail from Nikon PB-6E extension. Much longer than the standard dovetail supplied with the bellows, with more places to mount the Arca-swiss compatible plate. Therefore perhaps steadier than the standard PB-6 dovetail. M—Olympus BHMJ microscope focus block and mounting post. Mounting post was machined on the bottom by Don Wilson to give it very solid, removable mounting on base plate. He made the bottom perfectly flat and pressed a new threaded bolt into the tube and brazed it in place. On the underside of the base plate, he bored a conical countersink at the bottom of the hole through which this post is bolted. This conical shape locks the post very tightly in place. This block allows the subject to be raised and lowered—that is, “translation along the z- axis” (y-axis vertical equivalent). O—Newport linear stage model 462. Allows subject to be moved right and left. That is, translation along the x-axis (also the x-axis in vertical setups). Q—Newport rotation stage model 481-A. Can be turned by hand—nice and smooth with excellent dampening. Can then be fine adjusted with micrometer. Allows subject to be rotated as if on a turntable—aka rotation around the z-axis (y-axis vertical equivalent). 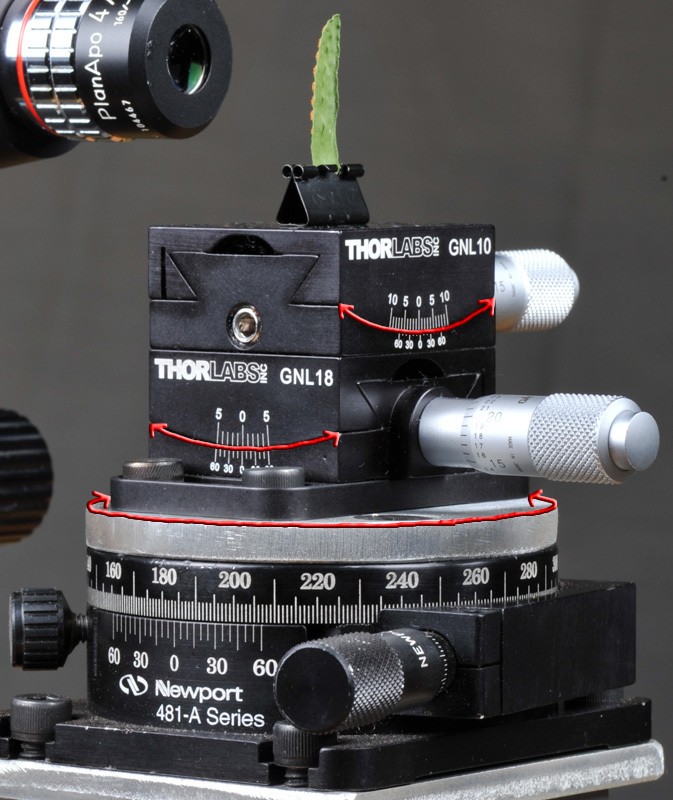 S—Thorlabs GNL goniometer, which consists of a stacked Thorlab’s GNL18 and GNL10. These produce tilt in two axes around a common “virtual point” one-inch above top of the assembly. Allows subject to be tilted side-to-side and front-to back—aka x and y-axis rotation (x and z axis vertical equivalent). Quite a few of the above parts were made for me by fabricator Don Wilson. When I started building this rig, I was a torn between attempting the metalwork myself or hiring it done. I’m very glad I chose the latter. When I approached Don, he had never worked on this sort of project--but from past experience, I knew he can make just about anything with metal. He ended up contributing not just fabricating skills, but excellent ideas. The Bratcam is a much better instrument because of Don's input and work. I asked Don if I could post his name and contact information, and he enthusiastically said “yes”—he’d like to do more projects like this one. He is local for me, but is happy to work at a distance with anyone by mail and phone. His charges were modest. I hadn’t originally planned to collect multiple copies of the 20x ELWD and 40x ELWD lenses, but it happened, and I plan to test sample variation before parting with the extras. Will share results with this forum. Bratcam lighting stage documented. Click here for details. Posted 12-06-10. Bratcam is now automated with a stepper motor and StackShot controller. Click here for details. Posted 12-12-10. Bratcam can now swap between a bellows (for finite microscope objectives, enlarging lenses, and bellows macro lenses), and a Mitutoyo tube lens assembly (for infinite microscope objectives). Click here for details. Posted 4-18-2011. Bratcam now has a laser to assist in aiming and focusing. Click here for details. Posted 11-07-2014. Bratcam now has a clamp assembly to hold camera body in precise register. This clamp is adjustable to fit many cameras. Click here for details. Posted 03-31-2015. Thanks, Eric! Got to say that adding the rotation stage/goniometer turned subject positioning, for me, from a frustration into fun. Before, I could never seem to move things just the right amount, generally bumping a specimen a bit too much or too little with any attempted adjustment. I also like how easy it is now to look through the viewfinder and examine the specimen as I turn and tilt it different ways to find the best angle. Elf, the handles are something I asked Don to add after I tried out an earlier iteration of the rig. With everything on it, this rig weighs about 50 lbs (23 kilos). Without the hand holds, I found it inconvenient to move the rig around the tabletop, and when I did move it, had to stop myself from reaching for the post, which probably does not benefit from being used as a handle. Those hand holds make it much easier to move. Also, I wanted this rig to be transportable. It's probable that I'll take it places from time to time--not into the field, but to a vacation home or friend's home where I'll work for a week or two at a time, shooting fresh local specimens. I found that if I need to carry this to the car, handles are a big help. Incredible piece of equipment -- very pretty! I confess, I'm still confused about exactly how the tilt adjustments work in practice. As I understand them, the pair of goniometers does a 2-axis tilt around a single pivot point that is one inch above the top unit. So it makes perfect sense to me that if the center of the subject happens to be located at the pivot point of the goniometers, you can fly the angles around with no frustration, at least as long as the angles are within the goniometer limits of ±5º and ±10º. But it seems to me that if the center of the subject happens to be above or below the pivot point, then tilting the goniometers also moves the subject either left/right off center or front/back out of focus. Yet you write "look through the viewfinder...examine the specimen...turn and tilt it different ways" as if turning and tilting were all that's involved. Have I missed something here, or are you very careful to always place the subject at the pivot point, or do the goniometers just provide a much better approximation of ideal behavior than say a ballhead would do? In practice, do you still find yourself jockeying left/right and focus as you turn and tilt, or is it good enough that you can just turn and tilt by themselves? To address Rik's positioning "point", I think there would need to be a low profile X-Y stage inside the radius of the top swing adjustment. There's not a lot of space, but I'm sure the ingenious Don Wilson could come up with something leaving room for the bulldog clip! Exactly - unless your subject is exactly at the centre of rotation you get an approximation of ideal behaviour. But, at least in my experience, with a somewhat similar setup, it makes life a lot lot easier. While I think it’s pretty too, and must confess to taking some pleasure in that, let me emphasize that I'm looking for function, rather than form. The black powder coating, for example, may look nice—but my intention was to prevent rust. Given that the cost of powder coating was very small ($10—I got a deal because I know the family that owns the powder coating business, but it would only be about $20 retail), that seemed like a no-brainer. On the other hand, I could have the custom aluminum parts anodized, but I can’t think of a functional benefit—though it might look nice. “Function,” for me, means a rig that makes it as easy as possible to make quality images at wide range of magnifications, including high ones. That requires (at least) a lack of vibration and other unintended movement, a wide range of adjustability in distance between camera and subject, the ability to rough position and finely focus the camera quickly, the ability to keep the camera, bellows, and lens balanced above the mounting point, and the ability to position the subject quickly and precisely. I hope my post didn’t give an appearance of an attempt to show off. My intent was to not to attempt airs, but, if the work represented in this rig has any value, to give that value back to this community. When I “discovered” this forum, I was working hard on improving my higher magnification macro work. I had Lefkowitz’s book and others, a fair amount of experience in lower-magnification macro work, some focus-stacking experience, and a lot of attempts under my belt at higher-magnification work that wasn’t as good as I wanted it to be. I was doing a lot of experiments, and while my results were improving, each attempt took time, so I was just inching forward. Then I found this forum, and here was knowledge and experience that would take me years to find out on my own—and some things I doubt I ever would have discovered. I found myself devouring every post, and struggling not to neglect my business. So when I got back to my own experiments, I felt like I was standing on the shoulders of the other members of this community. Now that I have something I like, I want to offer it up in case there is anything here of use to anyone else. You’re right, Rik. But to keep everyone on the same page, let me draw, in the picture below, the ways the subject stage rotates, illustrated in orange arcs. Please ignore the orange band around the lens, which I did not draw in. It’s just the color coding band indicating the lens magnification. The important thing, which might not be clear to all, is that the goniometer does not tilt on a pivot point within itself, but, as Rik indicated, "orbits" along a portion of an arc around a point above it—which is where one puts the specimen. This way, all rotational movement spins the specimen around itself. Right. But centering the subject is quite easy, and is one of the first steps I do when I use the instrument. When I designed the subject stage, I thought that exactitude in this positioning would be critical, and expected to make a simple target for centering. I still might—and what I have in mind is a pin with a red ball head that I’d removably mount one inch above the center of the goniometer. The goniometer top, by the way, is covered with a grid of threaded holes. I picked up a number of machine screws to fit these holes, and have the intention of making a variety of subject mounts that can be screw-mounted onto the stage. But so far, just sticking subjects in common binder clips, then removing the handles, has worked surprisingly well. This was something I did in a hurry one day, but have kept doing it because it works. Anyway, such precise positioning, while easy, has not yet proven necessary. I sometimes stick a small metal ruler vertically in the binder clip, put this in the center of the stage, and adjust the stage until the one-inch mark is in the center of the image frame (actually, I use a point slightly less than one inch, to account for the thickness of the binder clip). But as I’ll describe below, even this turns out to be generally unnecessary. You bring up a good point, that the goniometers are limited to ±5º and ±10º. When I was first considering them, I wondered if these limits would prove problematic. In practice, I’ve found the answer to be “no.” I find I can very easily rough position the specimen within those tolerances, and then use the micrometers to adjust it. I do generally first examine specimens under a stereo microscope (“dissecting scope,” as I was taught to call it). So before rough positioning, I have a pretty good idea of how I want the subject to be positioned. I do start out with the subject pretty much centered, but have found in practice that there is quite a bit of forgiveness in centering. I believe this is because the arcs of the goniometers are sufficiently large to make absolute centering somewhat less critical. As ChrisR points out in the post after Rik's, for the ultimate in centering precision without need for re-adjustment, I would need to add one more x-y stage inside the radius of the goniometer. And I might—would probably choose something thin, like an x-y movement from a microscope stage, to avoid using up too much of my one-inch clearance. But in practice, the subject stage turns out not to be so “fiddly.” I find I can usually rough-center the subject by eyeballing it, and then more carefully adjust with the various micrometers. If the side-to-side and up-down adjustment takes the subject slightly out of the center, it doesn’t seem to matter very much. Yes, I might refocus or adjust one of the other movements very occasionally, but I find I don’t need to do it all that much. I can turn and tilt with little fuss. So I don’t yet feel any compelling need to add the additional movements that ChrisR points out. If I do, I’ll start looking for a workable, thin x-y movement, and trust that Don Wilson can make me an adapter to mount it on my goniometer. I do try to somewhat careful about this, but don’t find that very difficult to do, and find that if I’m a bit off it doesn’t much matter. Again, I suspect that’s because of the largish arcs of the goniometers. (snip) do the goniometers just provide a much better approximation of ideal behavior than say a ballhead would do? Well, the goniometers work in pretty much the opposite way of a ballhead—at least the ballheads I’ve used. A ballhead is like the axle of a wheel, and the camera revolves around it like the rim of the wheel. A goniometer is like the rim of a wheel, and, if you place the subject about where the axle would be, the goniometer revolves around it. So yes, I would say the goniometers provide movement much closer to ideal than a ballhead would. In practice, do you still find yourself jockeying left/right and focus as you turn and tilt, or is it good enough that you can just turn and tilt by themselves? In practice, I find myself adjusting these things very little. Not quite never, but not often enough that I even think about it. LOL. I'd think you were "upstaging" me with your comment, and might want to "bellow" about it, but will try to maintain an "objective focus." Good point, Chris. For clarity, I went ahead and discussed your observation in my response to Rik. In short, I may add this additional movement at some point, but so far, the rig is forgiving enough that I haven't felt the need. Thanks, Andrew, and sorry about the long wait. I was committed to a huge project for a valued client, and working days, nights and weekends. Just finished, and wrote up my post. One finds oneself not wanting to write a hurried or slipshod post for this particular on-line community. So many smart and detail-oriented people here. I think you just covered as much ground as I did in my long response to Rik, but in way fewer words. I've got to remember Shakespeare's admonition that brevity is the soul of wit. For those without access to powder coating we can get Hammerite paint in the UK, which is similar to self applied powder coating. The original Hammerite, not the smooth, dries with a dimpled or hammered like crackle finish. In fact my Benbo tripod was finished in black dimpled finish using Hammerite by it's makers. Does not seem to have reached the USA yet though? I've just added a stepper motor to the focus rail on my setup and it was quite a bit easier than I expected. I'm using the Arduino micro controller board and Easydriver stepper controller. The Arduino is open-source and there's a ton of info and code available. Did you add a stepper motor to a microscope focus block, or to translation stage? Am right now noodling over a good way to mount one to a focus block. If you've done that, I'd love to see your approach. Have considered the Arduino, but am leaning toward doing this on a full-bore windows computer, rather than a micro controller. This is because I already have a computer next to the Bratcam for tethered shooting (very helpful to see the images immediately appear on a full-sized screen) and figure I might as well use it for stepping, as well. Am very willing to hear better advice, however. By the way, was blown away by your recent anemone panorama. Bravo! With a cheapie stepper motor you get 200 steps/rev, which is 1 micrometer per step for common Nikon and Olympus scopes. 1/16th steps from the cheapie driver boards gives steps down to 62 nanometers which is probably enough to keep Rik and Charlie happy for a week or two. I'm assuming the goniometers are aluminum. 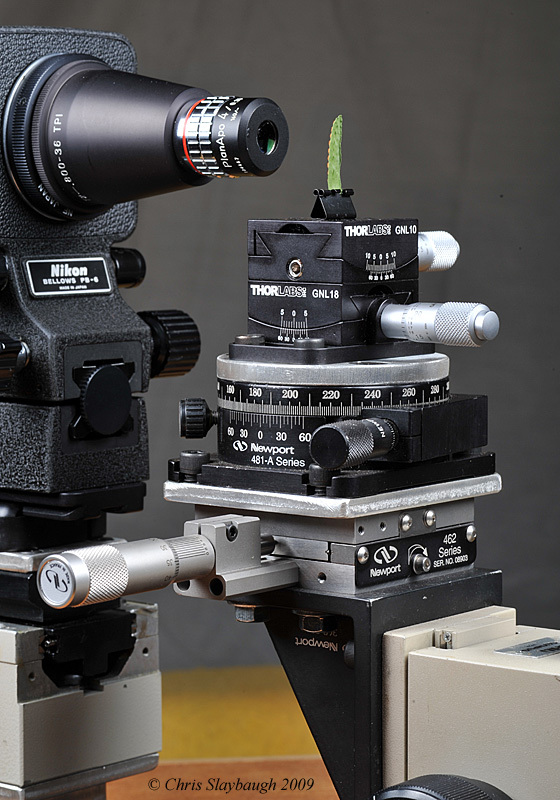 If you glued a thin piece of sheet metal on top of the stack (with holes to allow access to the threaded holes in the goniometer), you would be able to use magnets to position the subject. Are you limited to subjects less than 1" tall or can you replace "N" with other angle pieces to lower the goniometers?